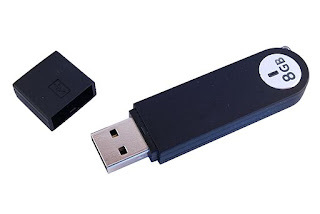 Are Your Files Stored on a USB Flash Drive? These data storage devices arrived around the turn of the century, and for many genealogists they contain a life time of genealogical and/or family history information and research. If the flash drive were lost, it would be detremental to their hard work. Ancestral Quest will prompt you to backup your data and what you back up to really does matter. According to Wikipedia, these devices are known as "a USB drive, USB stick, thumb drive, pen drive, jump drive, flash drive or USB memory". They replaced the small floppy disks of that time. They hold so much more data and are convenient to carry, however, if one is not careful, they can be accidently left behind on a library's computer or suddenly stop working. Over time, these drives have improved in the speed of data transfer, their storage capacity and their life expenctancy, however, like hard drives, don't last forever and most individuals rarely think about needing to replace them until it is too late. Advice to copy one's files to a main computer is good advice, as having backups both ways is the best way to go, create a folder on your main computer and copy the whole drive or copy it all to a cloud based area. Individuals hear of 'cloud based' storage for one's regular desktop and/or lap top computer, but one often forgets to back up any small digial devices at the same time. The end result is that over time these flash drives need to be replaced; like a computer needs to be upgraded. Unfortunately, there really are no warning signs they are going to fail which is the best reason to backup the contents on a regular basis. All storage devices come with warranties, however, the warranty is on the device and not the information on the device. Additionally, the life cycle of these devices is affected by the number of times you delete and add new information. When purchasing a flash drive one needs to look how the device is rated for write cycles, its ability to whether the kind of abuse it may take from dropping in water to walking over it all accidently. TopTenReviews checks all sorts of devices, software, etc. to help educate the everyday individual. They do have a great representation for the best top ten USB flash drives. In reviewing their choices, one can easily see how they are judged and you should be able to view their report and make a wise decision. Don't delay any longer, if you can't remember when you bought your flash drive and you don't want to lose all your genealogy and family history along with all you have stored on your current flash drive, then purchase a new more rugged flash drive and copy everything to the new device. Your ancestors will be grateful for your diligence and taking care of all your Ancestral Quest research. Take advantage of all the new features in Ancestral Quest 15 today!